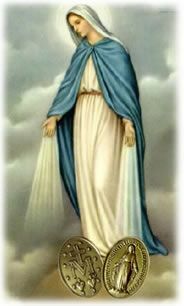 The rosary can become an opportunity for a real, prayerful union with the Blessed Trinity through our Blessed Mother. Some people, however, do have difficulty with the family especially because of children--from older teenagers to the young tiny children. And so we would like to give you a few tips. Remember, with the family or any group saying the rosary together, we must try to make it something that is beautiful and loving with every person involved. How can we do this? No one is forced to pray the rosary. If we do it nicely, everyone--even children--will consider it a privilege and pleasure. No one should have to pray the rosary (or to say any prayers) as a punishment. Who likes or loves what is given as a punishment? No one is expected to participate when that person has another important engagement. Let that person or child have a dispensation with the thought that he or she will be missed and we hope will join us in spirit and will say the rosary privately. No child is expected to participate longer than that child is capable. No child is expected to participate in an uncomfortable position. For a child, minutes can be a very long time. Choose a place that is best for all. Possibly change the place according to the weather or other circumstances. In nice weather perhaps out in the yard. If one person is sick, at his or her bedside. Choose a situation that is special--before a picture or statue of Mary, maybe with flowers and candles; take turns setting up a little shrine and decorating it. Kneel on pillows or sit or stand or a combination. Make it a celebration. For instance, if you have the rosary after the evening meal, have dessert after the rosary. Get everyone involved in all aspects of the rosary. Let each have his turn at picking the place, time, etc. But above all, each should be involved in the prayers themselves. Sometimes one or both parents lead and the children answer--and vice versa. (And the same with grandparents and grandchildren). Sometimes the men and the boys are the leaders; other times the women and girls. Children are expected to participate as long as they can do so. They differ so much. Perhaps those from two to five years old can join in for one or two decades and quietly leave to play elsewhere. Children six to eight years old may join in for three or four decades; those ten years old and above should be able to say the entire rosary. The family rosary could well be the family's night prayers and conclude with a hug and a kiss. Try to make the rosary a privilege and a pleasure. Everyone has a part in it. Each one can invite friends to join. The rosary is our offering together a bouquet of flowers to our Mother Mary, which she will also present to her divine Son Jesus in praise and adoration, thanksgiving and reparation and love. It is not as important as keeping the commandments, or participating in the Mass and sacraments, or loving God and our neighbor. The rosary is something added to those big important things. It is our heart's prayer--our own personal and family bouquet to Mary. It is what we love to give Mary and Jesus.